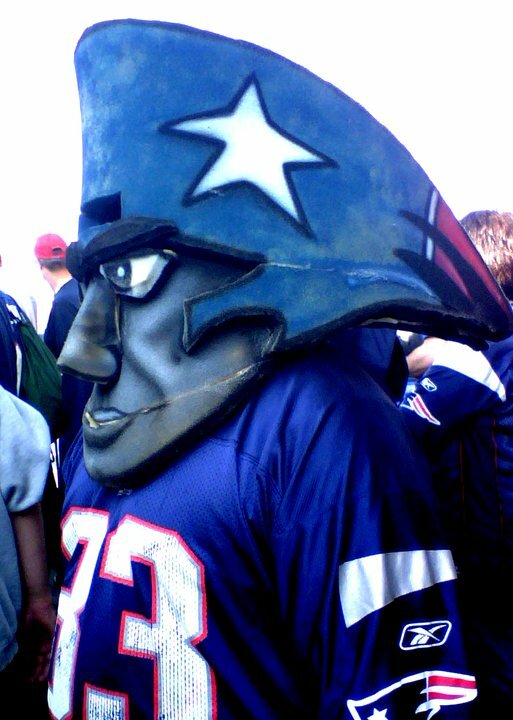 Rocco, We Hardly Knew Ye - Cursed To First - Sox and Pats forever. Anyway. By the time the magical union between New England native and his destined Red Sox roster spot arrived, things were not as they had been in the potential-filled early days of Baldelli's career. It had started in 2006, a season Baldelli characterized as perhaps the best of his career. He hit .302, with 16 home runs and 57 RBIs in just 92 games. He had missed the first part of the season and part of 2005 with a torn ACL and Tommy John surgery, just a few of the setbacks in a career seemingly constantly marred by injury. 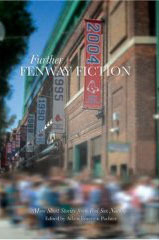 "It was muscle fatigue," Baldelli said. "A lot of people think I'm tired all the time. They think that I'm just tired, that I'm sleepy. That's not necessarily what it is that I've been going through. "Back when I wasn't feeling as well, it probably felt like I had just run 5 miles and I wasn't doing much, probably doing a normal baseball workout. My legs felt tired." While Baldelli has shared his diagnosis of channelopathy, that doesn't explain everything. Channelopathy does not describe just one disease. Instead, there are six or seven types of channelopathy in muscles caused by abnormalities in the tiny pores called channels. There are four channels - for sodium, potassium, chloride, and calcium [...] Almost all of these diseases are congenital, and they are usually diagnosed in the teenage years or in young adulthood. The diseases are similar in that they produce muscle weakness. Adding to the difficulty of diagnosis is the fact that channelopathy is a rare disease, something...a general neurologist might see in one or two cases in a career...because Baldelli has chosen not to be more forthcoming, it's impossible to know the specifics of the disease or how it will affect him this season. As it turned out, the disease, whatever it is -- Amalie was exactly right to note "channelopathy" doesn't totally narrow it down -- along with a lower position on a Boston depth chart than he'd occupied in Tampa Bay, limited Rocco to 62 games with the Red Sox. When he was able to appear, his production was at least respectable -- .253 BA, 7 HR, 23 RBI, .744 OPS in 150 ABs -- but not enough, of course, to feed the proverbial Monster. Still, what could have been a delicate matter, that a 'project' like Baldelli was to be the first player to don the sainted Nomar Garciaparra's No. 5, turned out to be hailed among the fan base as a grand idea before Rocco had played a day in a Boston uniform. He just felt like one of us; his modest contributions to Boston baseball were beside the point (a truly rare circumstance, for any player, if you think about it). It had always felt that way, regardless of which uniform he happened to be wearing. And this feeling still lingered, even as we watched what turned out to be some of the last swings of his playing career in Boston last September. According to Yahoo! 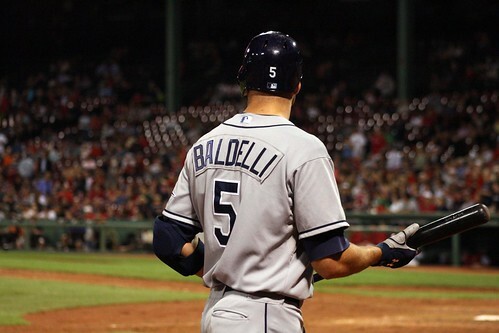 Sports, Baldelli appeared in just 10 games for the Rays last season, logging a mere 24 at-bats. Five of them came against Boston in an early-September series, four on Sept. 6 and a pinch hit late in the game Sept. 7. 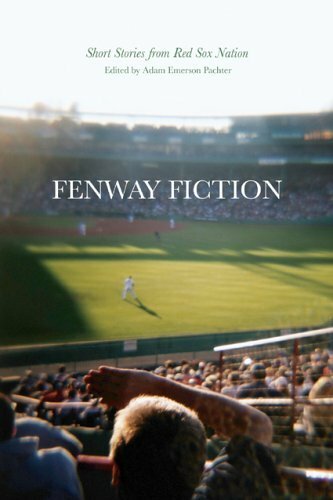 I happened to be at the latter game, and so, I realized today after hearing the news of his retirement, it turns out I witnessed Baldelli's final at-bat at Fenway Park. Baldelli's appearance came in the top of the ninth inning -- garbage time, in this 14-5 game, within the garbage time of this futile September stretch for the third-place Sox. I happened to be sitting in field box seats, just behind the visitor's dugout, and when the gray-uniformed No. 5 emerged from it to head toward the on-deck circle, he was showered with affectionate greetings from the Sox fans around me. Mostly they said, in low voices building to a crescendo, "Heyyy, Roc-co!" For a few minutes, that's all I heard, overlapping calls of that "Heyy, Roc-co! ", interspersed with claps and whistles. All without the slightest trace of sarcasm, which is not easy for Bostonians. Baldelli grounded out to shortstop in that at-bat, and that was it. He trotted back to the dugout with his usual quiet calm, and was left respectfully in peace by the peanut gallery. By this time, of course, in addition to knowing that Rocco hailed from Woonsocket, RI, we also knew what he was playing through -- what he'd been playing through for years. 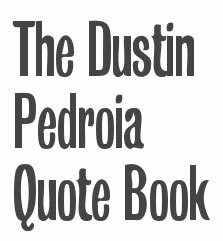 By this time, we knew that in the end, his illness meant his character and talent would have to be measured not in homers, All-Star votes or trophies, but in just how long he was able to keep playing Major League-level baseball at all. According to the most recent research, a study conducted in 2007 at the University of Colorado, the average length of a Major League baseball career is 5.6 years. Rocco had hung in for seven. There was nothing to do, even as he struggled in a division rival's uniform out there on the field last September, but wish him the best, and pay him respect. He's swapping out the uni for a suit now, but nothing about the rest of that has changed. Rocco was an outstanding prospect when he first broke in. He could have been a super star. It is really too bad he got sick. Nice guy and good for the game. Hope he has a long and successful career in the front office. I wish he could coach in the Boston system, for all the stupid semi-irrational One of Us! One of Us! reasons you detailed, but I guess it's nice to see that Tampa is showing him the respect too. Rocco was an excellent probability when he first smashed in. He could have been a celebrity. It is really too bad he got tired. Awesome guy and excellent for the experience. Wish he has a lengthy and effective profession in the top side workplace.